RAILROADS ILLUSTRATED ANNUAL 2018: NOW EXPANDED TO 116 PAGES! 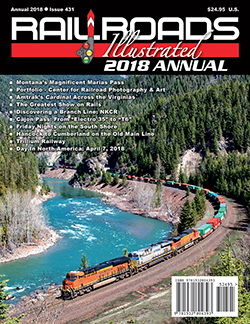 Published yearly, Railroads Illustrated Annual presents an expanded look at the exciting world of creative railroad photography. 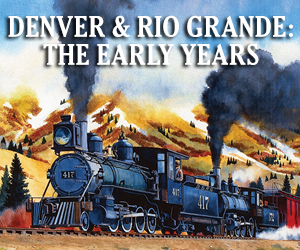 Every issue brings readers stunning pictorials coupled with lively text exploring contemporary and classic railroading. Full-length feature articles complement lavish photographs offering a breathtaking look at railroad operations across North America. Portfolio selections from the archives of The Center for Railroad Photography & Art – This year’s Portfolio features not one, but several photographers carefully selected from the vast photographic collection at CRPA. The images present classic vignettes of iconic railroading, ranging from New York Central’s coal-laden Livernois Yard captured in 1939 to Pennsylvania Railroad E-units at Chicago’s 21st Street crossing to a Milwaukee Road “Little Joe” at Ringling, Mont., and so much more. Noted photographers include Wallace W. Abbey, J. Parker Lamb, John F. Bjorklund, Robert Hadley, Fred Springer, and Ted Rose. This retro feature will stimulate your senses, as well as inspire you to explore the treasure trove of imagery and information to be found in CRPA’s more than 200,000 photographs. by Matt C. Batryn-Rodriguez – Follow along as Matt C. Batryn-Rodriguez chases the Ringling Brothers’ Barnum and Bailey Circus train across the Union Pacific Coast Line — a rare move even in 2011.
by Craig Walker – Happy coincidence led California native Craig Walker to discover the wonders of Burlington Northern’s (former Chicago, Burlington & Quincy) St. Francis Subdivision in Nebraska. Craig’s branchline feature proves the value of documenting otherwise ordinary railroad subjects before they’re gone forever. by Justin Franz – Experience Marias Pass through the lens of Justin Franz as he showcases BNSF’s main line to the Pacific Northwest. Readers will delight in spectacular views of BNSF and Amtrak trains with snow-capped peaks and pine trees serving as backdrops. by Mike Raia – Tag along as Mike Raia recollects several memorable rides on the South Shore from 1976 until the last regular service run for the 1920s-era passenger cars on August 26, 1983.
by Stephen Host – From Strawberry Fields to Steel Rails — Stephen Host provides an up-to-date look at this Canadian short line where Alcos continue to toil in regular service in the Niagara Region of Ontario. 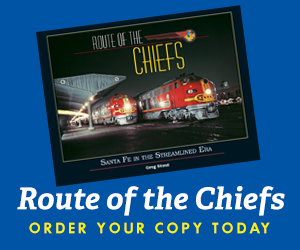 by Steve Jessup – The author learned the meaning of “railfan photographer” during his college years using Southern California as a backdrop and following the enthusiasm of a good mentor and friend. See Cajon Pass’ classic power through the lens of a Yashica Electro 35 and compare them to modern-day views via a brand-new Canon T6. by Eric Miller – The Cardinal is Amtrak’s only train that transits the Appalachians — that dark, foreboding land of misty, mysterious mountains, ancient rivers, and a proud, independent people. Eric Miller captures the palpable and unmistakable spirit of the Cardinal’s crew and route through the Virginias. by Travis Douthit – Travel back in time with Travis Douthit to catch the action throughout the Red River Valley of eastern North Dakota and northwestern Minnesota where BNSF, Canadian Pacific (Soo Line), Otter Tail Valley, Red River Valley & Western roamed over lush farmlands. by John Leopard – Winter — you either love it, or you hate it. For most, there is no in-between. Having grown up in the upper Midwest, John Leopard thinks “The more snow, the better!” Travel along on one of John’s more memorable winter trips. Readers across North America head trackside to record a typical day of railroading from coast to coast, April 7, 2018.